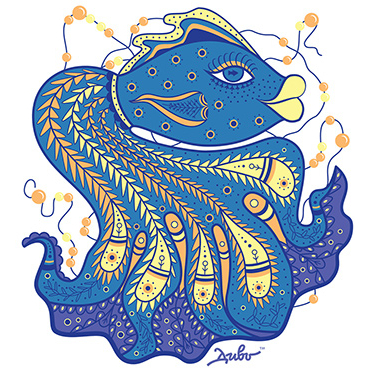 Meaning of illustration "Princess Koraliya"
This mysterious and beautiful resident of all water areas for millennia symbolizes fertility and wisdom, it is also a prototype of the female figure. The Miracle Fish also symbolizes harmony, tranquility and the beginning of life, an unbeatable combination of the figures of ancient Greek goddesses Demeter and Eirene. Coralia is not only a fish, but a wonderful pattern, which will bring wisdom and success in all your accomplishments. This amazing beauty with lovely and deep like the sea eyes can become an excellent companion for the girls, a bright addition to the female picture. It will help to have no doubt about the importance of the initiated, and will support you throughout the accomplishment of great things! However, this is not all, for example, in terms of our crowded life, large cities, it is important that the amazing Coralia-fish also represents balance and peace… it seems to have inspired already to conquer new heights! And yes, do not forget that our fish is a sister of the golden sea queen, so do not hesitate and make some wishes for all your secret desires to come true! 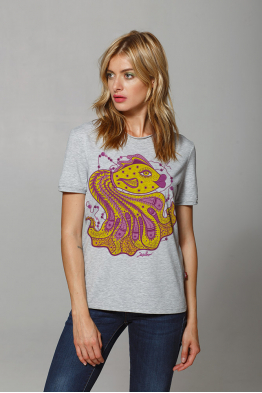 To your attention is presented not just a wardrobe item with the image of the sea queen. Blue as the.. Here it is - a beautiful queen of blue as the sky waves; the princess of the biggest spaces in the w..